The Joan Thirsk Memorial Prize is awarded annually for the Best Book in British or Irish Rural or Agrarian History in memory of Joan Thirsk. The prize was awarded for the first time in Spring 2017. One prize is made each year using the interest from the fund, topped up by the Society. Works entered can be concerned with any aspect of British and Irish rural or agrarian history provided that they use broadly historical methodology (so works of pure archaeology will not be eligible). Works by single or joint authors will be eligible but edited collections of papers will not. It is envisaged that the annual competition will be advertised each autumn, with the announcement of the prize winner made at the Society’s Spring Conference the following year. Joan Thirsk was the leading agricultural and rural historian of her generation. Her books and articles have a lasting influence. The fertility of Joan’s mind was such that she wrote a succession of pioneering articles, offering ideas and even creating areas of research which others took up and developed. She was an early writer on the family, on open fields, on the industrialization of the countryside. Her Economic Policy and Projects invented a history of the manufacture and consumption of ordinary things (‘starch, needles, pins, cooking pots, kettles, frying pans, lace, soap, vinegar, stockings do not appear on the shopping lists [of men] but they do appear on mine’). She was a historian of knitting, horticulture, tobacco and, of course, woad and our leading authority on early modern food. Her editorial labours, notably on the Agrarian History of England and Wales , were prodigious. And, one should not ignore – Joan would not forgive us if we did – her interest in (and and deep empathy with) her female predecessors in the history profession. Her kindness and generosity of time, advice and references to many historians was considerable. Joan was much more than an agricultural and rural historian and yet the British Agricultural History Society, of which she was a founder and loyal servant, always remained dear to her. In return the Society acknowledged her excellence by making her its president for two terms. Its members gave her a festschrift when she retired and another when she passed eighty. The Society now wishes to perpetuate her memory with an annual prize for the best book published in the broad fields of British and Irish rural and agrarian history. To that end we solicit contributions to a prize fund to be administered by the Society. The Society’s Spring Conference 2018 was held at the Cannington Campus of Bridgwater and Taunton College just outside Bridgwater, 26 to 28 March 2018. 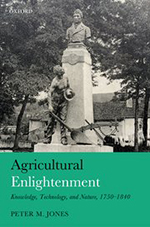 At the Spring Conference in Plumpton, Martin Thirsk, Joan’s son, presented the prize to Prof. Peter Jones of the University of Birmingham for his volume, Agricultural Enlightenment: Knowledge, Technology and Nature, 1750-1840 , published by Oxford University Press.